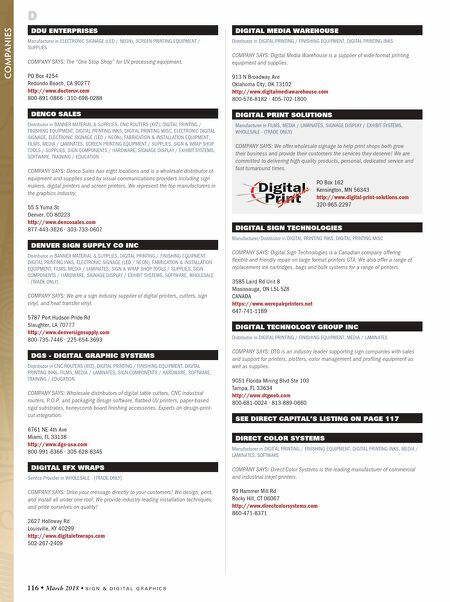 S I G N & D I G I T A L G R A P H I C S • March 2018 • 117 DRYTAC Manufacturer in BANNER MATERIAL & SUPPLIES, DIGITAL PRINTING / FINISHING EQUIPMENT, DIGITAL PRINTING MISC, FILMS, MEDIA / LAMINATES, SIGNAGE DISPLAY / EXHIBIT SYSTEMS COMPANY SAYS: Drytac is an international manufacturer of adhesive-coated products, including graphic films, window films, self-adhesive print media, label stock, industrial adhesives, and heat-activated and pressure-sensitive laminates and mounting adhesives. 5601 Eastport Blvd Richmond, VA 23231 http://www.drytac.com 800-280-6013 ∙ 804-222-3094 DSA PHOTOTECH Manufacturer in ELECTRONIC DIGITAL SIGNAGE, SIGNAGE DISPLAY / EXHIBIT SYSTEMS, SOFTWARE, WHOLESALE - (TRADE ONLY) COMPANY SAYS: DSA is a leading manufacturer of visual presentation solutions, offering the most extensive selection of edge-lit and backlit illuminated LED light boxes, fluorescent light boxes, and digital signage on the market today. 16961 Central Ave Carson, CA 90746 http://www.lightboxes.com 800-327-3723 ∙ 310-537-5000 DIRECT LED FRAMES Manufacturer in BANNER MATERIAL & SUPPLIES, ELECTRONIC SIGNAGE (LED / NEON), SIGN COMPONENTS / HARDWARE COMPANY SAYS: Manufacturer of innovative presentation systems for the framing retailer and textile printer. 130 Bosstick Blvd San Marcos, CA 92069 http://www.directledframes.com 760-598-5888 DIRECT SIGN WHOLESALE Manufacturer in WHOLESALE - (TRADE ONLY) COMPANY SAYS: Wholesale channel letter manufacturer. Your comprehensive source for superior letters delivered on time. Fast turn around times and timely delivery. 1100 E 64th Ave Denver, CO 80229 http://www.directsignwholesale.com 866-278-5543 D DIRECT CAPITAL Service Provider in FINANCING / LEASING SERVICES COMPANY SAYS: For 25 years Direct Capital has been providing small and mid-sized business with fast and easy financing to access the capital they need to grow and prosper. 155 Commerce Way Portsmouth, NH 03801 http://www.directcapital.com 877-786-5327 COMPANY PROFILE: Direct Capital provides businesses with fast and easy access to the capital financing. 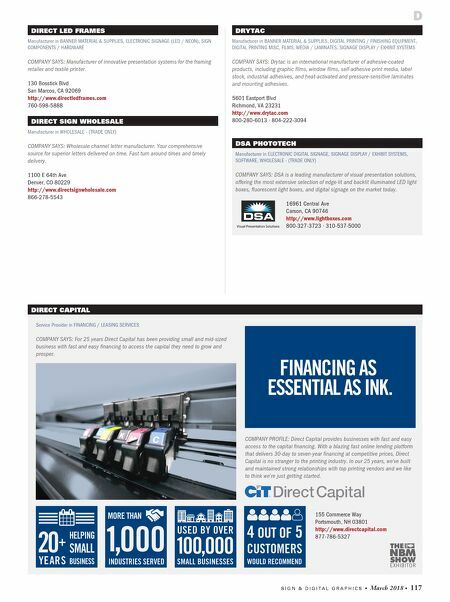 With a blazing fast online lending platform that delivers 30-day to seven-year financing at competitive prices, Direct Capital is no stranger to the printing industry. In our 25 years, we've built and maintained strong relationships with top printing vendors and we like to think we're just getting started.